What's the connection to Sunset Park, you ask? Well, we happen to have quite a few local kids who participate in the program. Some even include my students! Their reviews of the experience are uniformly positive. This is a fantastic program, and it deserves support. If you are looking for a donation opportunity, check out the information and the link below. Every year, The Fresh Air Fund gives thousands of inner-city children the priceless gift of fun – and opens the door to a lifetime of opportunities. Whether it’s a two-week trip to the country to visit a volunteer host family, or a fun-filled and educational stay at one of our camps, our programs make for unforgettable memories – and open a world of new friendships and fresh possibilities. We are a not-for-profit agency and depend on tax-deductible donations from people like you to keep our vital programs flourishing. Your year-end gift will allow us to invite even more children to experience Fresh Air summers full of learning, fun and new friends. Thank you so much for your generous support. Thanks to host families who open up their homes for a few weeks each summer, children growing up in New York City’s toughest neighborhoods have experienced the joys of Fresh Air vacations. More than 65% of all children are reinvited to stay with their host family, year after year. There is no such thing as a "typical" host family. If you have room in your home - and your heart - to host a child, you could be one too. 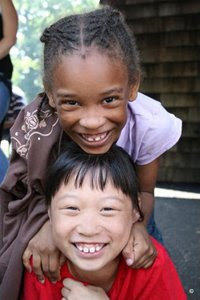 Fresh Air children are boys and girls, six to 18 years old, who reside in low-income communities in New York City and are eager to experience the simple pleasures of life outside the city.